Sun, Jan 20, 2019, 11:00 am SL Time, ColomboPage News Desk, Sri Lanka. Jan 20, Colombo: Boosting much needed farmer income and even blocking domestic market manipulations by the country's large rice miller oligopoly, Sri Lankan Cooperative System is taking on a new challenge. The Cooperative sector, which until now has been on the rice distribution end, is now stepping in to the country's fragmented rice supply chain, according to the Minister of Industry & Commerce, Resettlement of Protracted Displaced Persons & Cooperative Development Rishad Bathiudeen. "Our Cooperative system joining the rice milling system can help farmers to gain more profits while resulting in lower prices at the consumer end," Minister Bathiudeen said addressing a progress review of institutions under his Ministry, including Cooperative segment, on Thursday (17). Ministry Secretary KDN Ranjith Ashoka, and the Commissioner of Co-operative Development and Registrar of Co-operative Societies S. L. Naseer also joined the Minister at the meeting. Minister Bathiudeen, with his cooperative officials previously met representatives of All Island Farmers' Federation (AIFF) on 9 January. AIFF called Minister Bathiudeen's attention on their inability to pay off previous loans and difficulty in obtaining new working capital loans due to non-payment of previous loans. 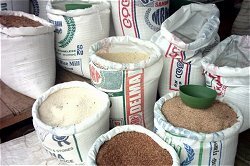 The millers said they are unable to settle loans since domestic rice processing declined in the last two years due to fall in paddy production on adverse weather conditions. Thereafter, on 11 January, on the instructions of Minister Bathiudeen, official representatives of Provincial Commissioners from key paddy Provinces of East, South, Wayamba, Central, North Central Provinces with the millers, met Minister's Cooperative officials in Colombo. Thereafter on 17 January the officials briefed Minister Bathiudeen on their progress. Minister Bathiudeen stressed to officials on the importance of Millers Co-operative Federation (MCF) which consists of 57 members. Accordingly, the eight Cooperative Societies, having rice millers as their members, are also grouping under the MCF which then directly links with Minister Bathiudeen's Commissioner of Co-operative Development (CCD). CCD is to assess working capital loan requests from MCF on behalf of its members. If cooperative project reports from MCF are viable and qualifying, they are recommended to the Ministry of National Policies and Economic Affairs (MNPEA), which shall then work with the Banks that consent the loans. When the loans are approved, the Federation shall receive them and shall distribute to its member cooperatives, and the coops in turn shall re-distribute to individual rice millers. The MCF will act as the mechanism to source loans for millers' Cooperatives, who otherwise struggle for loans due to the informal nature of the (cooperative) sector. Government's support to MCF through CCD results in cooperative sector's active entry to the supply side of Sri Lankan rice market, amply boosted by 2018/'19 Maha season's bumper harvest. As for domestic rice production, estimates for the latest Maha harvesting season (for 2018/19), show an increased, bumper harvest (up by 38 percent to 3.33 million metric tons from 2017/18's 2.39 million metric tons). Experts say that this bumper harvest provides the country with a rice stock sufficient for 7-8 months, without needing any new rice imports. After in-depth discussions, Minister Bathiudeen directed the officials to resolve funding issues of the millers' cooperatives and said: "Small and medium scale paddy millers in Sri Lanka are a consumer safeguard. In the face of their battle with largescale rice millers who manipulate and create price hikes in the rice market, it's these small millers who prevent such hikes and safeguard our consumers by stabilizing prices. Prime Minister Ranil Wickremesinghe as the Minister of National Policies and Economic Affairs achieved the Cabinet Decision of July 31, 2018, to provide credit facilities through the MCF and not to take legal action against the small and medium scale rice millers who have failed to settle previous bank loans - let us build on this and develop cooperative sector towards rice processing. Our Cooperative system joining rice milling and processing ensures farmer profits while resulting in reasonable rice prices at the consumer end." The Sri Lankan rice supply chain is fragmented. The majority of Sri Lanka's domestically produced rice (55% to 57%) is milled by around 1400 small and medium sized mills. The largest mills (around 220) are estimated to process about 33% rice and the rest is milled by "custom" operators.